Viking, in conjunction with the U.S. Consumer Product Safety Commission, is recalling certain Viking Built-In 48-Inch Wide Side-by-Side Refrigerator/ Freezers manufactured before March 1, 2005 and certain Built-In 36-Inch Wide Refrigerators with a bottom freezer manufactured before April 10, 2006. No 42-Inch or freestanding refrigerators are involved in the recall. Viking will repair all affected refrigerators free of charge in your home. 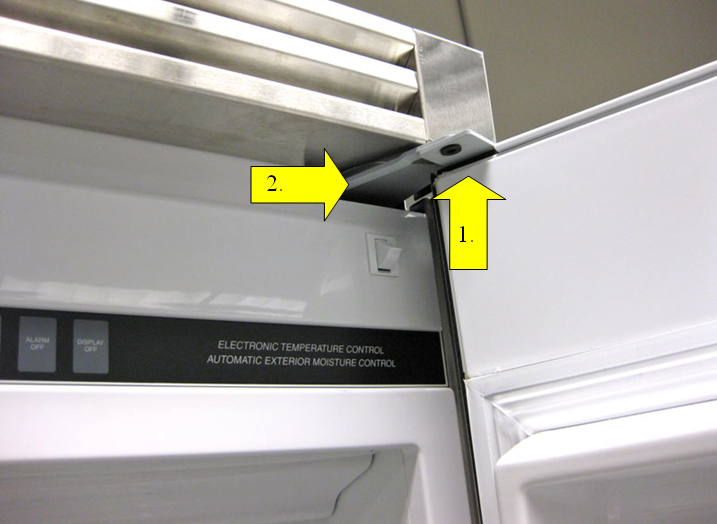 Screws attaching the pivot plate of the top hinge on the door of affected refrigerators may shear causing the door to detach from the hinge pivot plate creating a risk of impact injury or fall. Viking has received 4 reports of injury and has received approximately 53 reports of doors detaching, some of which resulted in property damage. You may continue to use the recalled products until they are repaired. However, you should inspect your refrigerator to see if the refrigerator door is exhibiting improper door sealing, door sagging or a failure to open and close normally. If you see one of these conditions, you should stop using the refrigerator and immediately contact Viking using the phone number below. Viking will repair all refrigerators subject to the recall at no charge to consumers. Please locate the model and serial number of your refrigerator which is located either behind the produce drawer or on the ceiling of the interior of the refrigerator. If your model number is identified in the chart below, locate the first six numbers contained in the serial number. The first six numbers contained in the serial number correspond to the manufacture date of the unit in [mm][dd][yy] format, e.g., serial number 051903G0000000375 was manufactured on May 19, 2003 and serial number F01250210170 was manufactured on January 25, 2002. If the first six numbers contained in the serial number correspond to a date prior to the dates identified in the chart below, your refrigerator is subject to the recall. 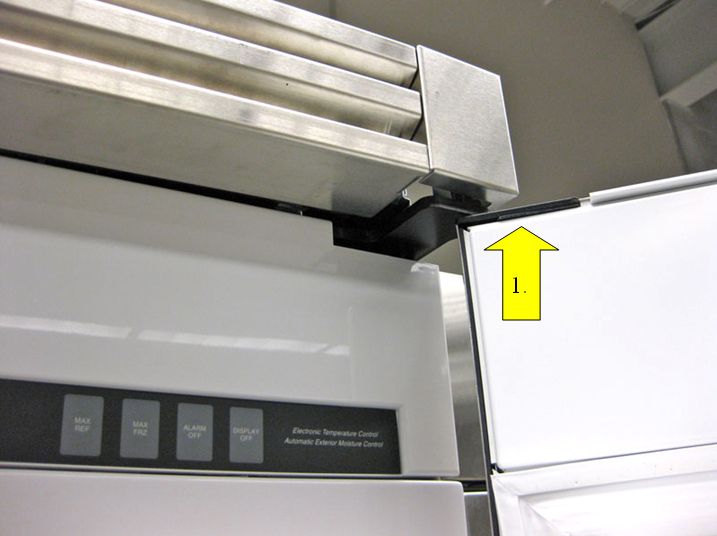 You may also compare your refrigerator upper hinge with the pictures located on the following page. If the hinge matches Figure A or Figure B, your refrigerator is not subject to the recall and no repair is needed. 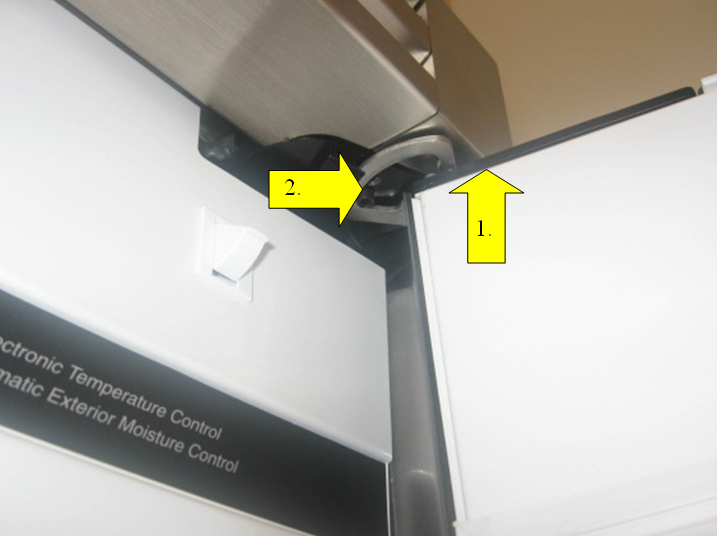 If the hinge matches Figure C, your refrigerator is subject to the recall and a repair is needed. Figure A: 1. Hinge pivot plate does not extend out from door. Not Subject to Recall. No Repair needed. Figure B: 1. Hinge pivot plate does not extend out from door. 2. Hinge has rounded edges. Not Subject to Recall. No Repair Needed. Figure C: 1. Hinge pivot plate does extend beyond door. 2. Linkage arm is showing. Subject to Recall. Repair Needed.